There are four lakes - all are well stocked with healthy, well developed fish. Pipe Lake is a member's only lake and Oak Lake, the Predator Lake and the Match Lake are all available for day and night fishing. 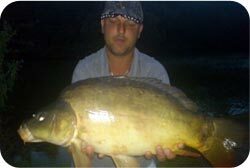 You'll be on a secure site, with bailiffs monitoring all the lakes. The swims are mulched with bark to ensure they stay well-drained and comfortable so you're not slipping and sliding in mud on wet days. There are unisex toilet and shower facilities handy and secure parking near to most swims. In fact, you can simply settle in and enjoy the day with the minimum of fuss and bother! Local takeaways and a local pub will deliver food and drink to the car park.